A recent article in EE Times discusses the future of Moore’s law: “Broadcom: Time to prepare for the end of Moore’s Law.” This comes up innumerable times. People assume that Moore’s law is synonymous with my law of accelerating returns, which it is not. 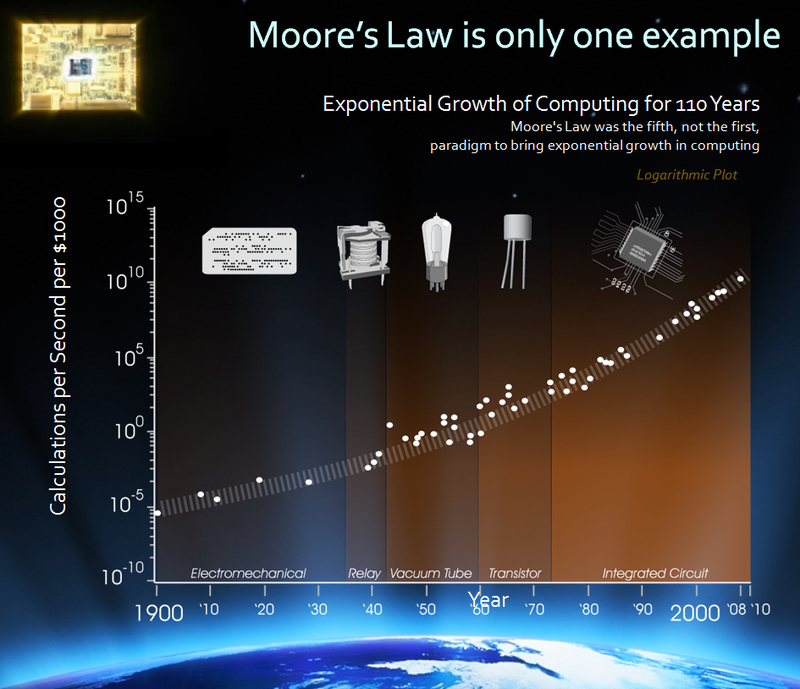 Moore’s law was the fifth, not the first, paradigm to bring exponential growth to the price-performance of computing. The law of accelerating returns does not pertain to feature size or clock speed but to calculations per second per constant dollar. Three dimensional computing will keep that exponential trend going for many more decades. I’ve long said that the paradigm represented by Moore’s law (shrinking transistor sizes on a flat integrated circuit) will come to an end in the early 2020s.